Your comfort and support are important to both of us! Godwin’s has invested in the best technology from the medical industry with our Support Report technology from XSENSOR. It will accurately diagnose your body’s pressure points and recommend the correct support type for you in an unbiased manner. This process ensures that you make the correct mattress selection the first time; one that fits you and your budget. We are so confident in this process that Godwin’s gives you this guarantee: IF AFTER 30 DAYS AND BEFORE 60 DAYS OF YOUR ORIGINAL PURCHASE YOU ARE NOT COMFORTABLE ON YOUR NEW MATTRESS, GODWIN’S WILL OFFER YOU A FREE ONE-TIME MATTRESS RESELECTION! Why guess? Now you can know with Support Report! 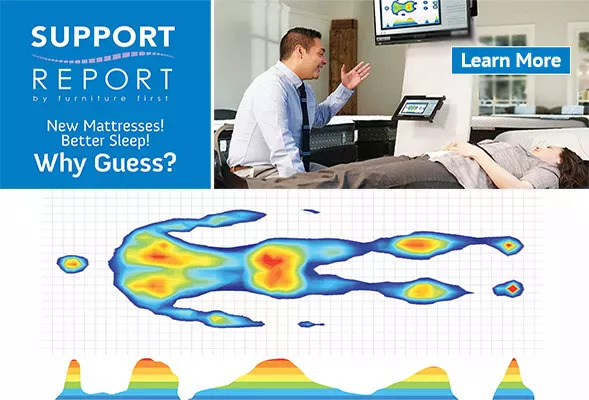 CONDITIONS: You must “take the test!” Your Support Report provides you with the correct mattress type for your comfort and support. Mattress set purchases of $599 and higher qualify. You must have purchased a premium zippered, 6-sided Mattress Protector and used it correctly along with the correct foundation. The mattress must be clean and not stained with law tags attached. If your reselection is a higher price, you will be charged the difference. A store credit will be issued if the price is lower. Reselections are limited to our delivery area and there is a standard redelivery fee. Outlet mattresses and display models do not qualify for re-selection. Mattresses, foundations, adjustable bases, frames, pillows, and protectors cannot be returned for refund. Exchanges of foundations or frames due to height must be done within 7 days and will be charged a 15% restocking fee and a redelivery fee.